Access ASD investigated how new digital technology could reduce social barriers amongst people on the Autism Spectrum. It’s estimated that around 700,000 people in the UK have autism, with a third of adults with the condition experiencing social and mental health problems due to a lack of support. Many people on the autistic spectrum find difficulties in interacting with other people, and the project worked with adults on the spectrum to identify what things cause them difficulties and to devise tools that might help. Access ASD was a 9-month Catalyst! sprint project. Through a process of close collaboration with adults with ASD, social groups and autism charities, the Clasp tool was prototyped. 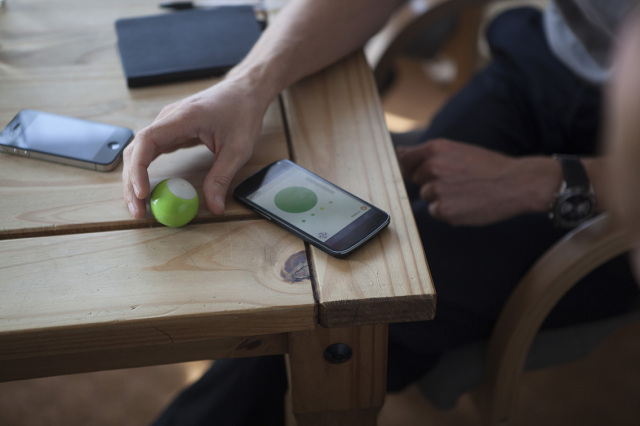 Here a squeeze-ball game controller is connected to a smartphone to allow tracking of anxiety levels for self-reflection, and non-verbal communication to social support through SMS and social network posts. Clasp uses the Blobo game controller, runs on Android smartphones and the Diaspora* social network. In August 2014 BBC Click made a film about Clasp, you can view it here: http://www.bbc.co.uk/news/technology-29031641 Clasp has since been funded further by the EPSRC and work will recommence in February 2016.